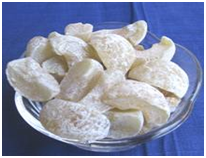 Learner will able to understand about preparation of pickle from different fruits and vegetables, fruit candy, nut brittle- their costing and preservation techniques. 1. To know the pickle recipe. 2. To take all ingredients in appropriate proportion. 3. Selection of sound and firm fruits. To know the candy recipe. 2. To take all ingredients in appropriate proportion. 3. Selection of sound and firm fruits.